Plan out your home defense scenarios so that you control as much of the battlespace as possible. Use quality hollowpoint pistol ammunition. On July 13, 2007 — Friday the 13th, oddly enough — I received a phone call from Jim Cirillo, Jr. He told me his father had been killed in a traffic accident the night before. As I set the phone down, I was flooded with the memories of a man I had known for some 35 years. Gun enthusiasts and trainers knew him as the epitome of the modern police gunfighter. He was one of the most misunderstood men I’ve ever known. Too many never got past the trigger finger to see the heart and the mind of Jim Cirillo. A cop on NYPD for a decade before he had to kill a man, six or so tumultuous, bullet-shattered years on the famed Stakeout Unit (SOU) defined him in the public eye. It was easy to forget that after he retired from the city, his next career as an instructor — first with US Customs, then at the Federal Law Enforcement Training Center, and at last in the private sector after he “retired” — saw him save even more lives than those future deaths he prevented when he shot down vicious armed robbers who gave him no choice. Jim wrote an excellent book still available from Paladin Press: “Guns, Bullets and Gunfights.” If you’re serious about armed self-defense, it belongs in your library as surely as “Cooper on Handguns” and “No Second Place Winner.” The direct quotes that follow, unless otherwise noted, come from that important book. Jim could have written another, perhaps in several volumes, on his own experiences in this vein. I can’t cover all Jim’s incidents in the space allotted here, but I’ll cover three of them. If the choice of those particular incidents surprises you, it probably indicates you didn’t know Jim Cirillo. “I was never so terrified in my whole life. They never told me in the academy that the targets were going to jump and move all over the place. There wasn’t one 3′ by 2′ target to shoot at like on the police range. One gunman only gave me a 6″ circle of his moving head to shoot at. The other two jumped behind the cashier and only exposed about 9″ of their bodies on each side of her. During those hectic microseconds when I popped up from concealment, my protective crotch piece fell off my bullet-resistant vest. I prayed that none of the gunmen would hit me in what I considered a most vital area. He had done better than he knew. The robber who wasn’t going anywhere was mortally wounded by a bullet through the brain. Jim had hit him three times in the head with 110 grain Super Vel semi-jacketed hollow point .38 Specials. Two of the bullets had skidded off his skull, leaving him up and running. The third had ended his deadly threat. The other two thugs had escaped, one half-carrying the other. Both were arrested that day when they attempted to seek treatment for gunshot wounds. Cirillo had hurt each of them badly enough to make them desperately flee the fight. six rounds, and shot all three armed felons, in three seconds. Jim told me at the beginning of the fight he was so scared his tongue was stuck to the roof of his mouth; but when his .38 came up and he saw a sight picture, a strange calm seemed to descend upon him, as if something was telling him he was in his world, on his turf, now. Automatic pilot took over as his finger rolled the trigger, the way it did in PPC matches, of which he had already won so many. Jim experienced a phenomenon known as psychological splitting, a sense there were two of him. There was a passive, “Conscious” Jim, who focused on the front sights and watched the blurred figures he was aiming at react to the shots, as Conscious Jim thought to himself, “Who the hell is shooting my gun?” And there was the active, “Subconscious” Jim, who was tracking the moving targets and smoothly stroking the double action S&W’s trigger. To fully understand why Jim’s performance that day, some 40 years ago, has become so widely recognized as a genuine “feat of arms,” one has to remember the distances involved. Jim fired those shots at 60 to 75 feet — up to 25 yards — from the perpetrators, in a crowded market, shooting two of the perps out from behind a human shield. You won’t find this one in Jim’s book, because he titled that “Guns, Bullets and Gunfights,” and this story would have been off topic. I wish he had written another book and called it, “The Job.” I suspect this incident would have been one of the first chapters. I asked Jim once, which of all his encounters he was most proud of. It turned out to be an incident where he and his partner looked through the one-way glass at the stakeout scene and saw a young man who obviously had a hidden gun. They were poised to open fire as soon as he made a hostile move, but something told Cirillo that things weren’t as they seemed. Telling the partner to cover him, Jim took off his armor and his heavy duty belt with its two .38s and five reloads of ammunition, stuffed one of his Model 10s into his belt to supplement the Colt Cobra he always carried in a pocket, and put on a windbreaker to cover his uniform. Then he slipped out of hiding and out into the store. Cirillo made his way to the suspect, realizing as he approached that the guy was even younger than he looked through the milky one-way glass. He jumped the suspect, disarmed him, and put him on the floor. By the time the suspect was handcuffed, he and his partner realized that their gunman was a young teenager with a starter pistol. A supervisor put in for Cirillo to receive a medal for his courage above and beyond the call of duty. It was overruled by higher brass. They had decided that taking off the armor he was supposed to constantly wear on stakeout had violated unit regulations, and thus, could not possibly be rewarded. The NYPD is a department with a lot of heart, but in any organization of more than 30,000 people, it is possible for the heart to be choked by regulations. People who didn’t know Jim and signed up for one of his classes often expected him to do nothing but brag about his own exploits. Anyone who thought that, didn’t know the man. Few American cops have ever earned more “been there, done that” creds in gunfighting, but Jim learned early that no two shootings were likely to be the same, and he was more likely to draw learning points from the many other gunfights he had studied, than from his own. One he frequently cited was one in which he participated, but in which his own life was saved by his partner, one of his best friends. A tip had been routed to the SOU that there would be a robbery at an airport hotel. The commander assigned his two most accomplished marksmen. If memory serves, the site was the Air Host Inn. With Cirillo was his most frequent stakeout partner, Bill Allard. Bill was as good a bullseye shooter as Jim was a PPC competitor, though he was no slouch at either game. Allard shot whenever he could as a military reserve at Camp Perry (where he would one day win a national champion title), and one year there had purchased a beautiful Colt National Match .45 auto. It was his favorite handgun, and as designated firearms instructor for the SOU, he had a loophole that allowed him to carry it “experimentally” on duty, even at a time when official regs restricted officers to .38 Special revolvers. 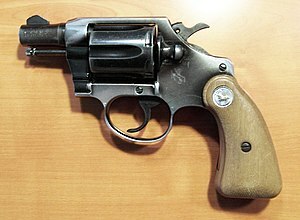 While the department-mandated issue, non-expanding 158 grain standard pressure lead .38 ammo at the time, the penalties for carrying something else were not as strict as they would be later, and both Cirillo and Allard were fully prepared to endure a slap on the wrist if their non-approved ammo ended a gunfight more quickly. On this particular stakeout, that .45 auto was Allard’s primary weapon, and in its chamber — backed up by a magazine of hollow points — was a handload he and Jim had worked out, featuring a cup-point bullet with full wadcutter profile. Let Jim tell the story: “I had confronted what was supposed to be two juveniles who had previously held up a certain hotel, always with their hands in their pockets. Bill and I had set up a plan with the desk clerk where he would use a code word when speaking to this juvenile team. When we heard the coded word, one of us would go out a side door and cut off their escape. “Sure enough, the clerk panicked and gave us the code word, only this time it was with a different armed team. As I slipped out the side door, what a surprise I received — both individuals were armed with autos! They both pivoted at my movement. The first gunman swung his weapon in my direction, but I dared not fire with a lobby guest directly in the line of fire. The gunmen then swung their weapons back and forth between me and the clerk. I yelled for them to drop their weapons. I knew the first character was doped up and wasn’t going to let anyone get in the way of his next dose. As he swung his weapon back on me, I prayed that his shot would miss my unprotected neck and head. “It seemed like an eternity before I saw the billowing dust and gun smoke pour out from behind the hotel desk and then heard the shot from Bill’s .45. The first gunman reared up from a crouch, walked backward on his heels for about four steps, then fell backward. He was dead before he hit the hotel floor. The second gunman dropped his weapon and ran for the exit. Neither Bill nor I fired for fear of hitting pedestrians outside the hotel entrance. Jim so frequently used this incident as a case study in class because it was high in learning points and low in machismo. It pointed up the need to rely on your partner, and the fact no one person can always manage things alone. Just as movement of innocents in the dairy store had prevented his partner from firing, but permitted Jim to shoot because of his slightly elevated position in the manager’s booth, the Air Host Inn situation left Cirillo unable to shoot because of the unexpected movement of a hotel guest into his field of fire. Cirillo emphasized tactics as much as he did marksmanship. Studying the SOU in the early 1970s, I accompanied stakeout sergeants Tom Derby and Augie Luciente as they scoped out establishments that were candidates for SOU protection. Angles of fire, angles of view, paths of access and egress were all carefully examined. Sometimes, the unit would literally restructure their potential battleground. Installation of one-way mirrors was one of their favorite strategies. Jim always pointed out to his students the importance of predicting what could happen, and controlling the scene as much as possible before the gunfire erupted, and reminded them that the same principles applied to armed home protection. He understood the term “gunfight” is a misnomer. The guns don’t fight, the involved human beings do. Cirillo observed the best gunfighters on the unit were competitive shooters accustomed to shooting accurately under pressure; and hunters, the latter less because they had taken some degree of life than because they had conditioned themselves to watch an area for certain things with unrelenting focus, without being distracted. Those who came to know Cirillo were often surprised he was far from the steely-eyed killer they expected to meet based on his reputation. Jim was an ebullient, outgoing man, always smiling and always joking. Facing death had taught him to love life. He was very much a family man, a loving dad to son Jim, Jr. and daughter Margie, and was devastated by the untimely death of his wife and soul-mate Mildred. For the last nine years of his life, he found happiness again with partner Violet Martinez. Hunting or fishing, dinner out or just good conversation with friends, Jim was a man who had learned to appreciate — and do something useful with — every minute. Not all of his colleagues coped so well as he. The SOU had a high incidence of cardiovascular problems, ulcers, PTSD and other stress-related problems. One member’s heart stopped at age 36. Have heard of this man before,never having read anything concerning his experience. what a humble man of character he must have been. One heak of a revolver shot,too. From former Stake Out Unit member Bob H.
Thank you very much for your comment. You guys saved more lives than you know.